North Macedonia (Macedonian: Северна Македонија, Severna Makedonija, Albanian: Maqedonia e Veriut), officially Republic of North Macedonia (Macedonian: Република Северна Македонија, Republika Severna Makedonija, Albanian: Republika e Maqedonisë së Veriut) is a landlocked country in the Balkans. It is bordered by Serbia and Kosovo to the north, Albania to the west, Bulgaria to the east, and Greece to the south. While easily accessible from all points abroad, and boasting all the amenities of the Western world, North Macedonia remains one of Europe’s last undiscovered countries: a natural paradise of mountains, lakes and rivers, where life moves to a different rhythm, amidst the sprawling grandeur of rich historical ruins and idyllic villages that have remained practically unchanged for centuries. The majority population is ethnic Macedonian and Orthodox but there is also a significant Albanian Muslim minority. Therefore, one can expect a wonderful mix of architectural and ethnic heritage. The country represents the Balkans in the truest sense, consisting of a fascinating mix of Greek, Albanian, Turkish, and Mediterranean influences. North Macedonia is a country with many ethnic minorities. There is still some ethnic tension between Albanians (who form the majority in the northwest) and Macedonians, so this is a subject best avoided. It almost came to civil war a few years ago. North Macedonia has warm, dry summers and autumns, and relatively stable winters with fairly cold temperatures. North Macedonia is covered by mountainous territory marked by deep basins and valleys filled with fruity goodness. There are three large lakes, Ohrid lake, Prespa lake and Dojran lake, each divided by a frontier line, and the country bisected by the Vardar River. North Macedonia is dotted with beautiful Orthodox churches, monasteries, and Ottoman mosques. The territory of the North Macedonia has a proud history. Being under the Ottomans for 500 years caused legendary revolutionaries such as Dame Gruev, Boris Sarafov, Nikola Karev etc., to lead uprisings in 1903 in the then region of Macedonia. North Macedonia has been part of many countries, but until its incorporation into Yugoslavia by Tito in 1945 it was never acknowledged as an administrative "state." North Macedonia prospered under Tito's rule, especially when the capital Skopje was rebuilt after a severe earthquake in 1963 and the Yugoslav government invested heavily in the subsequent infrastructure rebuilding. This may explain why many Macedonians are somewhat nostalgic for Tito's Yugoslavia. International recognition of North Macedonia's independence from Yugoslavia in 1991 was delayed by Greece's objection to the new state's use of what Greece considered a "Hellenic name and symbols." Greece finally lifted its trade blockade in 1995, and the two countries agreed to normalize relations, despite continued disagreement over the use of "Macedonia" in the name. On 25 January 2019 the ratification process was completed and now North Macedonia will become official. Greece is now the largest investor in the North Macedonia. North Macedonia's large Albanian minority (about 25%), an ethnic Albanian armed insurgency in North Macedonia in 2001, and the status of neighboring Kosovo continue to be sources of ethnic tension. There were also tensions during the last parliamentary elections on the 2nd of June 2008, although they happened between supporters of the two biggest rival Albanian political parties. 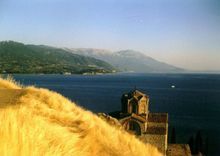 Ohrid, a lakeside resort and UNESCO World Heritage Site. It is considered the jewel in North Macedonia's crown. Bitola, the second largest city. It is North Macedonia's most "European" town. It has it all: an ancient city, Ottoman monuments, a lovely shopping promenade, great nightlife, and more. Kruševo, a museum-city nestled high up in the mountains of southwestern North Macedonia. It is one the most historically significant destinations in the country as it was the site of a revolt against the Ottoman Empire. The town is also home to great skiing. Štip, a peaceful city in eastern North Macedonia. The town has existed for thousands of years, which is evidenced by its many archaeological sites. Radoviš, a small city in southeastern North Macedonia, famous for the new Holy Trinity Orthodox Church. Strumica, a vibrant city in the warm, sunny southeast. Progressive Strumica is home to great shopping, nearby hiking, waterfalls and hot springs, and the legendary Strumica Carnival. Nationals of all European Union countries, plus Albania, Andorra, Antigua and Barbuda, Argentina, Australia, Azerbaijan, Bahamas, Barbados, Bosnia and Herzegovina, Botswana, Brazil, Brunei, Canada, Chile, Costa Rica, Cuba, El Salvador, Guatemala, Honduras, Hong Kong, Iceland, Israel, Japan, Kazakhstan, Kosovo, Liechtenstein, Macau, Mauritius, Mexico, Moldova, Monaco, New Zealand, Nicaragua, Norway, Panama, Paraguay, Peru, Russia, Saint Kitts and Nevis, San Marino, Seychelles, Serbia, Singapore, South Korea, Switzerland, Taiwan, Ukraine, United Arab Emirates, United States, Uruguay, Vatican City and Venezuela may enter North Macedonia visa-free for up to 90 days. Those from the European Union, Albania, Bosnia and Herzegovina, Kosovo, Liechtenstein, Serbia and Switzerland may enter using a national ID card in lieu of a passport. For British nationals, only British Citizens, British Overseas Territories Citizens with passports issued in Gibraltar, and British subjects with right of abode in the United Kingdom enjoy visa-free entry. All other British nationals must apply for a visa. Nationals of Montenegro and Turkey may enter North Macedonia visa-free for up to 60 days. Montenegrins may enter using a national ID card in lieu of a passport. Nationals of Malaysia may enter North Macedonia visa-free for up to 30 days. Nationals of Belarus and Georgia ay enter North Macedonia visa-free for up to 90 days, provided that they hold "tourist vouchers", or travel in a group organised by travel agencies. Nationals of any country who hold a valid Type "C" multiple entry visa for, or Permanent Residency of, the Schengen Area, in addition to those who hold a valid visa for Canada, the United Kingdom or the United States, may enter North Macedonia for up to 15 days visa free. Temporary residence permits for the Schengen Area are not accepted. All those who do not fall into the above categories will need a North Macedonia visa for entry. In addition to a visa, nationals of Afghanistan, Algeria, Angola, Bangladesh, Burundi, Cameroon, China (PRC), Congo, Egypt, Ethiopia, Gabon, Ghana, Guatemala, Guinea, Guinea-Bissau, Honduras, Iran, Iraq, Jordan, Lebanon, Libya, Morocco, Niger, Nigeria, Oman, Pakistan, Philippines, Rwanda, Saudi Arabia, Senegal, Somalia, Sudan, Syria, Tunisia, Vietnam and Yemen need approval from the Ministry of Interior. North Macedonia has two international airports, the main airport in the capital Skopje "International Airport Skopje" (SKP) and another in Ohrid "St.Paul the Apostle Airport" (OHD). There are around 150 flights in a week from different European cities to Skopje. North Macedonia Government awarded one Turkish Airport Operator Company (TAV) a contract to construct a brand new Terminal building in Skopje Airport. Construction was completed in October 2011. From the low-cost airlines, Skopje is accessible by Wizz Air from London (Luton Airport), Venice (Treviso Airport), Dortmund, Milano (Bergamo), Basel, Munich (Memmingen), Eindhoven, Malmo, Gothenburg and Stockholm (Skavsta). From April 2014, Skopje will also be accessible from Paris (Beauvais), Brussels (Charleroi) and Frankfurt (Hahn). Another option to travel into North Macedonia is to fly to Thessaloniki (SKG) or to Sofia (SOF) and get a taxi or bus from there. There are 5 buses from Sofia Central Bus Station to Skopje, leaving at 9:00, 12:00, 16:00, 17:00 and 00:00. The two bus companies which operate these services are MATPU and Kaleia, both of which are located outside the main bus terminal. Single ticket is approximately 16 Euros (32 Lev). There are also services from Skopje to Sofia at similar prices and times for a return flight home. If you fly to Thessaloniki, you can go by public bus (24/7) for 0,50 EUR to the train station and catch a train from there (14 EUR one way). Regular train service connects the North Macedonia to Greece in the South (Note 13 April 2011: all international trains to Greece have been stopped until further notice as of February 2011) and Serbia in the north. Be sure your Green Card (International Insurance Card) has an uncancelled "MK" box. Try to get a good map of North Macedonia and/or try to be able to read Cyrillic letters. Although most street signs are printed in Cyrillic and Latin letters it can be helpful to have a little knowledge of the Cyrillic alphabet, especially in small towns. The border guards often make a big deal about having the original documents for the car (no copies). The enforcement rate about this is 50-50 and if you have a rental car this can be a problem as you usually have a copy. Tourists have been told in the past to drive back several hundred kilometres over this detail by certain power hungry guards. In Skopje, there are two bus terminals. Most buses come to the new terminal, but some connections are serviced by the old one, which is located at the city center. If you need to change the terminals, you need to walk to the stone bridge over Vardar and cross the bridge (about 2.5 km) or take a taxi. Within Skopje, the tourist will usually get around by taxi. For a longer stay, you can get a bus card and a map of the bus lines. In Ohrid (the most usual tourist destination), you can walk almost everywhere; the exception is that the bus terminal is at the edge of town, and you will use a taxi to get to your hotel. Between cities, the most usual public transportation is bus. Taxi is also possible, although more expensive; if you are a group of four, taxi might make sense monetarily. Trains are infrequent and get you to fewer destinations than buses. Renting a car, of course, makes you freer, and lets you see more. Intercity bus is the normal way for locals to get from city of city. The buses are modern and comfortable. The Skopje bus and train station are in the same building. At present (2018), you cannot buy a bus ticket on line; you can only buy it at the bus station. The bus between Skopje and Ohrid takes about three hours by the shortest route, and costs about 500MKD ... about $10, one way. There are about 15 buses a day on this route. In high-season, they may be sold out, so it is best to go over to the bus station the day before to get your ticket. In general, main roads are good. (Stay off the very minor ones ... watch your map!) They may be narrow and winding, as they pass through mountains. North Macedonia requires lights to be full on at all times, day or night. No turns on red lights. Taxis are perhaps the most common mode of transport in North Macedonia amongst tourists. Most will usually charge a flat rate of 30 denars (in Skopje 50 denars) with the extra kilometres added on. Be careful when negotiating the price of the fare beforehand. Within city limits, prices over 100 denars are considered expensive even though the amount only converts to a few Euro. North Macedonia cities are much smaller in comparison to most western developed countries and would only take approximately 10-15 minutes to travel from one side of the city to the other by car. In Skopje, the capital and largest city, this should work out to an amount of about 100-150 denars. A general exception to this rule is during peak tourist seasons particularly in the town of Ohrid. The summer months are the most profitable for many small businesses in Ohrid (and for some businesses, the only profitable months) including taxi drivers. For this reason many drivers will charge up to three times the flat rate for the same distance. Most taxis will insist on driving for no less than 100 denars which can be heard as "sto denari" or a "stotka" (slang term for a one hundred denar bill). Generally this is excessive but you can either negotiate the price down to 80 or even 70 denars to be reasonable, or else simple bargain hunting is all that is required. During the peak seasons it is possible to find drivers willing to go as low as 40. Never feel pressured to take a taxi that seems overpriced. Languages: Macedonian 66%, Albanian 25%, Turkish 4%, Romani 2%, Serbian 1%, other 2%. Macedonian and Albanian are the official languages. 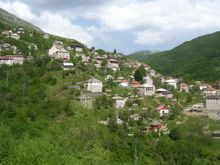 Šuto Orizari Municipality (better known as Shutka), which is part of the city of Skopje, is the only place in the world where Romani is a co-official language. North Macedonia is a small country but there are a lot of things to see in it. Its capital Skopje is the biggest city and upcoming European city, with the Vardar river running right trough it. It has a multitude of sights worth seeing: Kale fortress is kind of a city symbol. Right under it lays the beautiful Old Bazaar with many cafeterias and restaurants. Its main sights are St. Spas Church, Kurshumli An and many more. Over the famous Stone Bridge you can get to the main square "Macedonia" where you can see the 22-meter statue of the ancient Macedonian leader Alexander the Great, as well as the biggest shopping center in the city "ГТЦ". Other interesting sights are the Memorial House of Mother Teresa and the Millennium Cross on the top of mountain Vodno, which is a 66-meter cross and it is the biggest cross ever built. It is reachable by the newly opened cablecar and by foot. It is possible to walk up and take the cablecar back down, paying the fare upon arrival. The Skopje Old Bazaar ("Stara Charshiya")is a good place to look for jewelry. Silver, gold, filigree. At the far end of the Charshiya is the "Bit Pazar", a maze of winding paths through hundreds of tiny shops, where you can buy meat, cheese, fruit, henna, hardware, clothing, toys, cradles, ... well almost anything. Ohrid is famous for "Ohrid pearls", made from fish scales by a secret process. No, they aren't real pearls, but they are very good imitations. There are dozens of jewelers in the old town that will offer good products at decent prices. The Macedonian Orthodox paintings in old Ohrid are also worth a look. The official currency of North Macedonia is the denar, symbolised by MKD, placed before the amount with no intervening space. Most cities have ATMs where you can withdraw money with cheap commission rates, although there are also plenty of banks and exchange booths where you can easily change money. There are ATMs at the Skopje and Ohrid airports. Do not change money on the street. The North Macedonia denar is "pegged" to the Euro at an exchange rate of about 62 denar to the Euro. Other rates in the table below will vary. For example the American dollar-to-denar rate will vary according to the exchange rate between the dollar and the Euro. If you are travelling from Britain, exchange your currency before you leave. British exchange offices will only accept the 1000 denar note and nothing else. Typical Macedonian food resembles the food of the southern Balkans, meaning loads of grilled meat (known as skara). Side dishes usually have to be ordered separately. North Macedonia is also famous for its shopska salata a mixed salad of cucumbers, tomatoes, and grated sirenje. Sirenje is a white cheese similar to feta cheese. Usually Macedonians will translate the English cheese to sirenje. Another local speciality is ajvar, a red paste made from roasted peppers and tomatoes, which is either used as an appetizer or side dish. Another typical local dish is taratur which is comparable to the Turkish cacik. It is made of yogurt, cucumbers, and garlic and it is served as a cold dip. Tavce gravce (pronounced tav-che grav-che) or тавче гравче in Macedonian is the national dish and unique to North Macedonia. It basically consists of beans, paprika and other vegetables so can be eaten by vegetarians. Traditionally, it is served with cut sausage mixed and eaten with bread. It is a delicious meal that will definitely leave you feeling full! Rakija is a strong grape brandy that has the best claim to be the Republic's national beverage. There are also many breweries which brew surprisingly good-tasting beer. Macedonians boast the largest winery in the Balkan area—the Tikveš (Tikvesh) winery in Kavadarci. Red wines are usually better than white ones. Try "T'ga za Jug"— Macedonian favorite affordable red wine made from a local grape variety called Vranec. Local white wines include Traminec and Temjanika. The local beer market appears, in Skopje at least, to be dominated by Skopsko, a drinkable, if not entirely distinctive, lager. Being the national tourist attraction, Ohrid is obviously more expensive than any other destination in North Macedonia. Note that hotel prices are very expensive throughout the country and charge double rates to foreigners. It is therefore advisable to stay in private accommodation. If someone does not ask you at the bus station, you can always consult one of the many travel agencies in and around the center. If you do opt for private accommodation make sure you see the room first and then decide. Payment is normally made in advance and should cost no more than €10-15 per night per person in peak season and half that during the rest of the year. Note: finding suitable accommodation in July and August is not easy, so try and book through a travel agent in advance. For those interested in learning the Macedonian language, the options are the official Center for Testing and Certifying Macedonian as a Foreign/Second Language CETIS MAK. You can also get certified with the Test in Macedonian as a Foreign Language - TEMAK, and get a certificate issued by the Ss. Cyril and Methodius University. The Macedonian Language E-Learning Center  is a non-profit organization that offers free Macedonian Language instruction online and for credit through the University of North Carolina. Also, there are several private language schools offering courses for foreigners. Some of them are: LinguaLink, LogosOxford , VortexCenter . University for Information Science and Technology "St. Paul The Apostle"  - a new state university located in Ohrid. The university's language of instruction is English. International students are required to pay a tuition fee of 4000€ per year. Ss. Cyril and Methodius University  - the biggest state university in North Macedonia, founded in 1949, located in the capital Skopje. Today it represents a family of 23 faculties, 10 institutes and other institutions. Goce Delčev University  - the second biggest state university, located in Štip with many branches in other cities in Eastern North Macedonia. It was founded in 2006. St. Clement of Ohrid University  - is one of the fifth state universities, located in Bitola with branches in other cities in Western North Macedonia. It was founded in 1979, but the name St. Clement of Ohrid was not given until late 1994. The current number of enrolled students exceeds 15,000. State University of Tetovo  - is a state university located in Tetovo. The university was established in 1994, however, it was not officially recognized as a state university by the government of the Republic of Macedonia until January 2004. The languages of instruction are Macedonian and Albanian. South East European University  - is a not for profit private university in Tetovo. It was founded in 2001 and is a member of the European University Association. The languages of instruction are English, Macedonian and Albanian. FON University  - a modern private university. International Slavic Institute - a private Russian university located in Sveti Nikole and Bitola. With majors in Psychology, Finances and credit and Management. University for Audio-Visuel Arts - European Film Academy ESRA  - a private university, part of the French Film School Ecole Supérieure de Réalisation Audiovisuelle  located in Paris and New York. North Macedonia is a safe country. Driving is not ill-advised, but it's recommended for foreigners to try and use taxis and public transport wherever possible. Keep an eye out for pickpockets and all valuables safe. Hotels and most private accommodation will offer a safe to store valuables and cash in. As with any other country, use caution when eating red meats at restaurants. Although Macedonian cuisine typically revolves around grills ("skara") there are some restaurants that do not use proper or clean methods of cooking, which if practiced in many Western countries would be seen as a violation of certain health regulations. Bad restaurants can be spotted easily; they will probably not look very appealing and will not have many customers. However, the vast majority of restaurants in North Macedonia serve good quality food. Touchy topics are Macedonian-Bulgarian, Macedonian-Albanian, and Macedonian-Greek relations. Most Macedonians can hold strong political opinions regarding their neighbours and won't shy away from expressing their views in most cases. Politics often finds its way into conversation over a cup of coffee. To keep from upsetting your hosts or new-found friends, avoid topics such as the 2001 war against the NLA , North Macedonia's partition during the Balkan wars, North Macedonia's pending membership into the European Union or Nato and the name disupte with the Greek province of Macedonia. Don't worry about talking about the Communist period or about Josip Tito. Domestic telephone service is available in all inhabited towns, via the PSTN or VoIP. The PSTN network is run by T-home. There is an affordable fixed phone service (wireless and easy to install) from the mobile operator ONE, avaliable prepaid (without a monthly fee, 12 months availability without recharge, recharging for only 500 denars -18€) and postpaid. Mobile phones are widely spread and the coverage is excellent. There are 3 mobile networks (T-mobile, One and VIP), all using the GSM/3G standard. You can buy a pre-paid SIM card from T-mobile for 295 denars (5€) with 250 denars free talk time, from ONE for 190 denars (3€) with 250 denars free talk time, and from VIP for 300 denars (5€) with 300 denars free talk time. You may need to show your ID card or passport when buying. Internet access is widely available. Broadband internet is available through cable, ADSL, WiMax and LAN connections. You can also access internet with your mobile phone, via GPRS or 3G. ONE offers both internet for home and mobile internet. More information here . T-home offers ADSL internet for 599 denars/month (10€) - 30GB bandwidth, 6Mbps speed - you need to have PSTN connection from T-home. Internet cafes are available in most cities and in some villages.